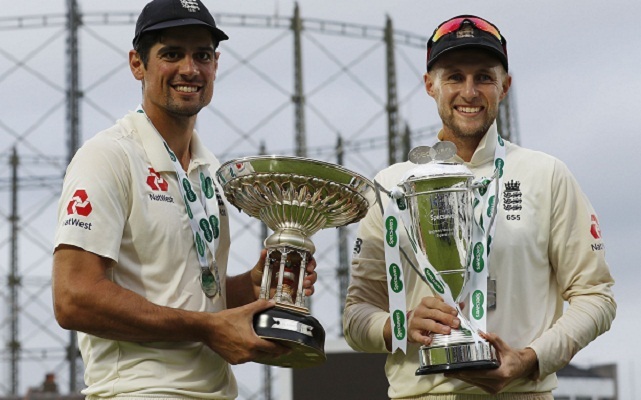 James Anderson became the most successful fast bowler in Test history when he sealed England’s 118-run win over India at the Oval on Tuesday. With just one wicket to fall, and Anderson needing one more to break the record of 563 he had shared with retired Australia great Glenn McGrath, the 36-year-old Lancashire paceman bowled Mohammed Shami to give England victory in the fifth Test and a 4-1 series win over the world’s top-ranked side. The scale of India’s task could be seen from the fact that no side have made more in the fourth innings to win a Test than the West Indies’ 418 for seven against Australia at St John’s, Antigua in 2003. Alastair Cook was named man-of-the-match after England’s all-time leading Test run-scorer made 147 in his final innings before international retirement. India captain Virat Kohli, who tried to lead from the front with 593 runs this series, praised the fight shown by Tuesday’s century-makers. All eyes were on Anderson as he bowled Tuesday’s first over, with the overcast conditions seemingly in his favour. He turned one sharply out of the rough outside Rahul’s leg-stump to clip the top of the right-hander’s off-stump.